Goddammit what is so cool about Che? the guy cared about the poor. and I only think of that aphorism about how you can fight for peace. and no one puts my face on a T-shirt. 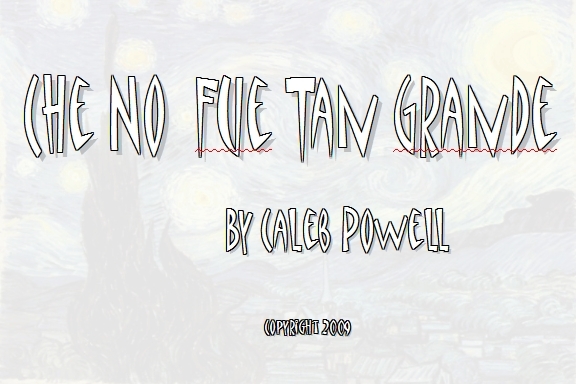 Copyright 2009, Caleb Powell. © This work is protected under the U.S. copyright laws. It may not be reproduced, reprinted, reused, or altered without the expressed written permission of the author. Caleb Powell (http://calebpowell.wordpress.com) was born in Taiwan. After graduating from the University of Washington he returned to study Mandarin and teach English. He has also lived and worked in South Korea, Guam, Thailand, The United Arab Emirates, Denmark, Brazil, and Argentina. A Canadian small press, Good Cheer, published his guidebook, The World is a Class. His writing is published or forthcoming in decomP, descant, Drunken Boat, elimae, Errant Parent, flashquake, Monkeybicycle, The Pedestal Magazine, Word Riot, Yankee Pot Roast and others.